Hungarian Prime Minister Viktor Orbán’s visit to Israel last week came at a moment in which the latter’s slide into legally-sanctioned racism has taken on particularly stark colors. In the final meeting of its summer session, the Israeli Knesset enacted the “Nation-State Law,” formally enshrining the ethnic exclusivity of the Jewish state and the degraded status of its Palestinian citizens. Though the bill passed narrowly, it has met with little public push-back. In an ironic sign of the times, another new law ruling out state-funded surrogacy for gay couples has sparked middle-class revolt and declarations of support from such institutions as tech companies and universities – all of whom have remained silent on the Nation-State Law. 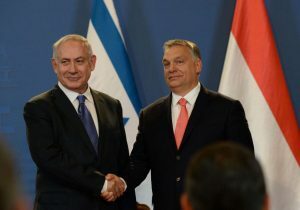 Netanyahu’s support is crucial for Orbán, who has quite accurately been depicted as deploying anti-semitism in his war on the cosmopolitan liberalism exemplified by George Soros. Netanyahu and his milieu have been generous with ideological cover, from his cretinous son’s enthusiastic propagation of anti-semitic alt-right memes targeting Soros to recently revealed lobbying efforts within the Trump administration [Hebrew]. Critics of Zionism have long pointed out its disavowed commonalities with anti-semitism, but now these commonalities appear to be coming out of the closet with astonishing rapidity, as Israeli right-wingers dare to ask on Twitter (Hebrew) “who was more responsible for the destruction of Hungarian Jewry”, fascist dictator and Orbán role model Miklós Horthy, or Hungarian Jewish leader and sometime collaborator Rezső Kasztner.